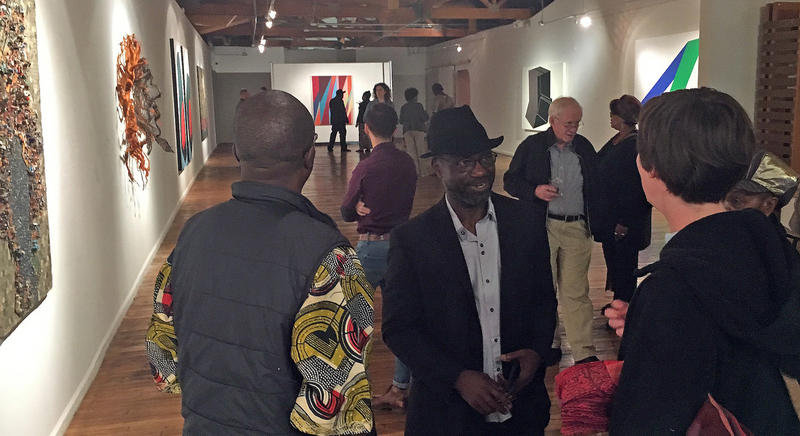 Curated by Nigerian born artist Osi Audu, “Abstract Minded: Works by Six Contemporary African Artists,” at the N’Namdi Center, is an exhibition that surveys a confounding issue in the history of modern art, which is the lineage of the use abstraction in contemporary African art. For most people, their first association with African Art is ethnographic and stereotypical otherness, but also the exotic richness, of “primitive African iconography.” Thanks to the Detroit Institute of Art’s great African collection, many of us have grown up with that legacy. But now it is truly refreshing to get a glimpse of internationally known contemporary African artists in N’Namdi’s iconic space. 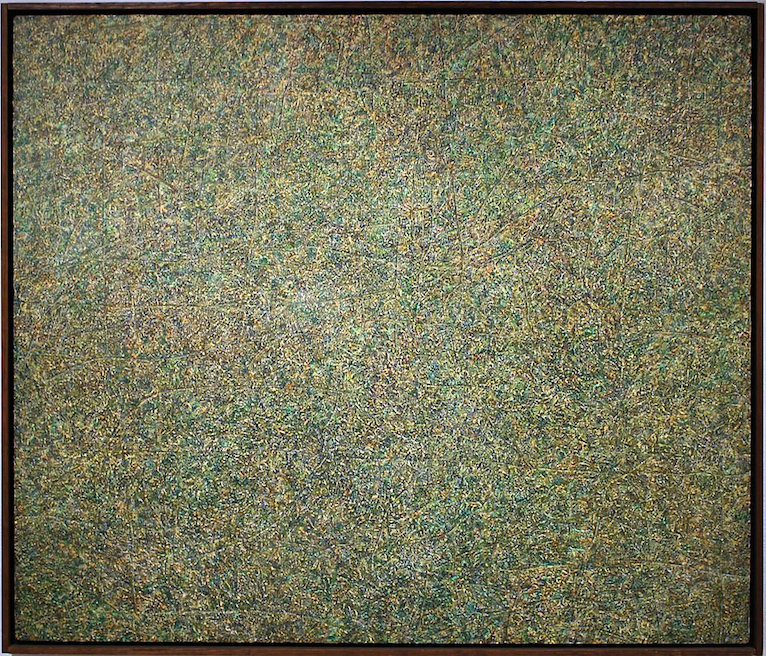 Each of the five artists represented in Audu’s selection employs abstraction in a unique and revelational way, showing the effect of over thirty years of economic globalization in general and on art practices in particular. 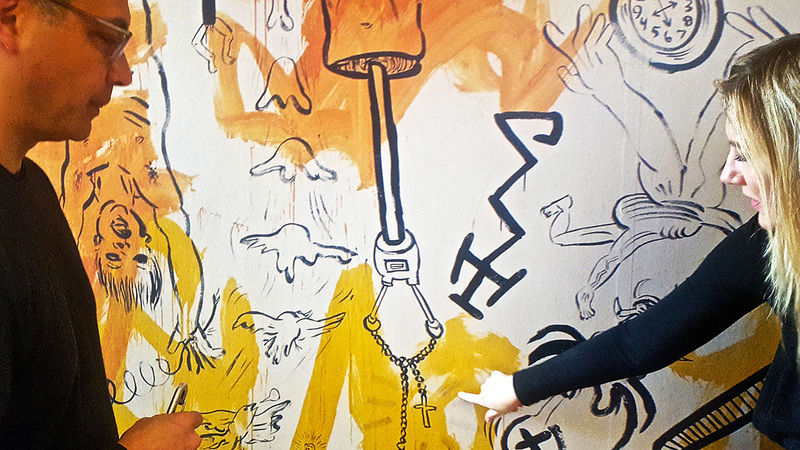 Serge Alain Nitegeka is a Burundi-born artist living and making art in Johannesburg, South Africa. 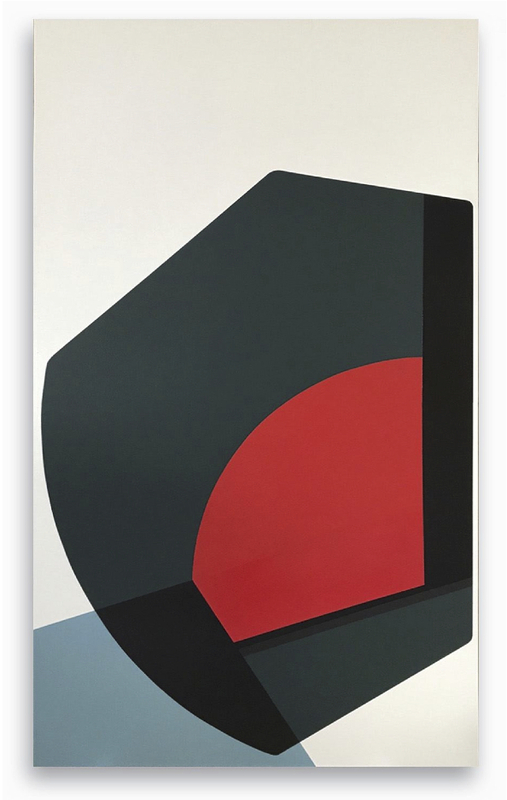 While there are only two of his paintings in the exhibition, Nitegeka’s work participates in a dialogue with the dynamics of geometric abstract shapes and, in his drama of the manipulation of tilted planes, of geometric, colored shapes engaged in a Constructivist tradition. We can go back to the beginning of the century to the Russian Supremacists and El Lissitsky to find the origins of this work. Much of Nitegeka’s inspiration, the gallery guide explains, comes from a fascination with the built infrastructure of Johannesburg itself, the highways and buildings and basic structure of its urban landscape, in other words, contemporary Africa. He has achieved an international reputation for his large-scale installations. Equally renowned is the work of Ethiopian artist Elias Sime, whose work echoes the bricolage strategies of many Detroit artists. In pieces composed of reclaimed electronic components — hundreds of cell phones, computer mother-boards, miles of color-coded wires — Simes constructs, with obsessive mastery, complex images of delicate line and color that are metaphorical in thinking about the interconnectivity and dependency of all of our lives on a global scale. They are also quite simply sublime in effect. From his “Tightrope” series, “Tightrope Contrast” is magical. Each of the eighty 8”x12” panels of which it is composed can be read as independent, abstract cartoon landscapes or topographical maps, suggesting an epic tapestry of tangled narratives. From the same series, “Tightrope: Mobile2,” fiendishly composed of thousands of discarded cell phones, is a giddying delight when one thinks about the millions of voices and words that occurred with these phones and that the sculptural relief represents. It is a triumph in recycling, as well a majestic work of art! 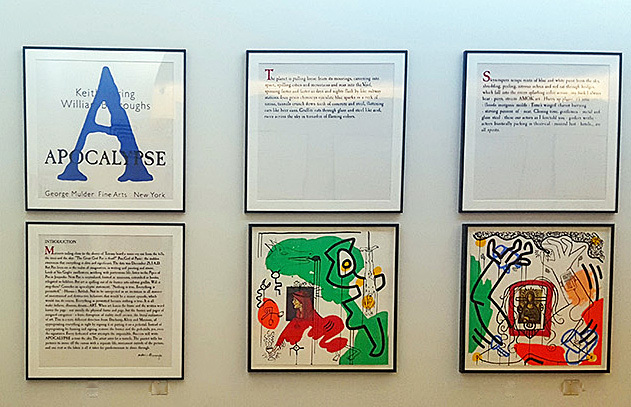 For one gnarly reason, Osi Audu, the curator of the “Abstract Minded,” and Elias Sime have the most amount of work in the exhibition and that reason is the cost of insuring the works of art. 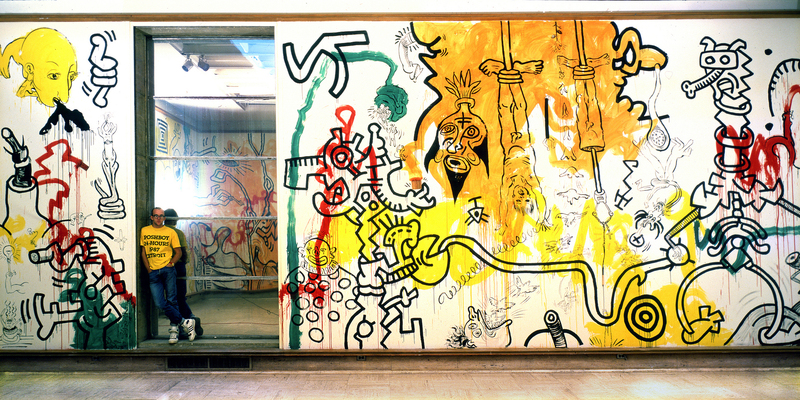 Quite simply it is outrageously expensive to bring in and insure many high-profile artists’ works. Nevertheless, and thankfully, Audu and Sime are well represented with four works each. Sime and Nitegeka have focused on the material culture of contemporary Africa — buildings and highways, the technology of cell phones and circuit boards — translating these modern materials into geometric forms in the universal language of abstraction. Osi Audu, on the other hand, in a complex negotiation of the ethnographic history of the Yoruba philosophy, has turned the history of African cosmology back on itself to create conceptual self-portraits. Proceeding from the Yoruba belief in the architecture of the head as a model of the inner and outer head, of the spiritual and physical, Audu has explored African identity through its art. Employing the Ogoni, Benin, and Etsako peoples’ tribal masks, he has used that process of mind, the analytical process of seeing a form called abstraction, to invent alluring new shapes that he calls, without irony, “self-portraits.” In a sense, the process seems to negate the ethnographic reality of African culture on behalf of the currency of the global language of abstraction. However, the forms that have emerged become, in and of themselves, identities. The “Self-Portraits” become logos of the real. 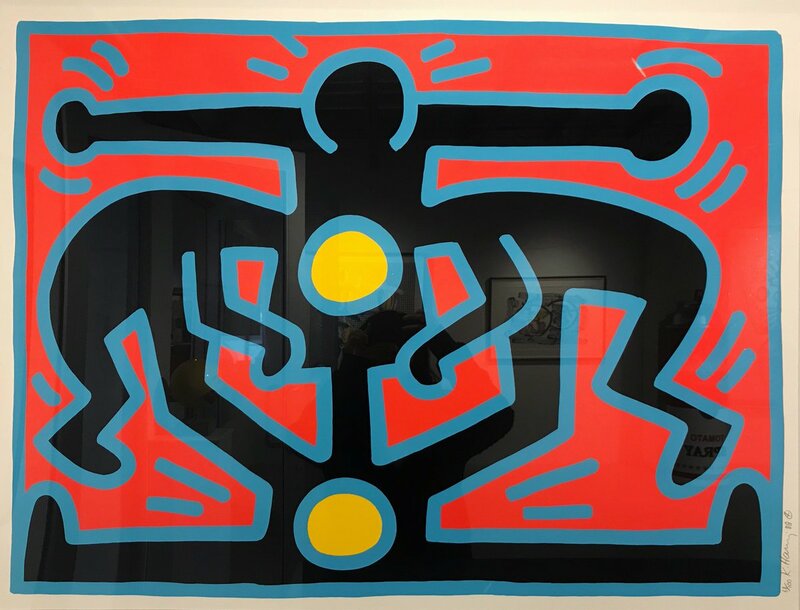 Audu’s strategy only succeeds because of their fundamental success as images; as enigmatic shapes, they carry a mysterious presence that is equal to that of the tribal masks themselves. 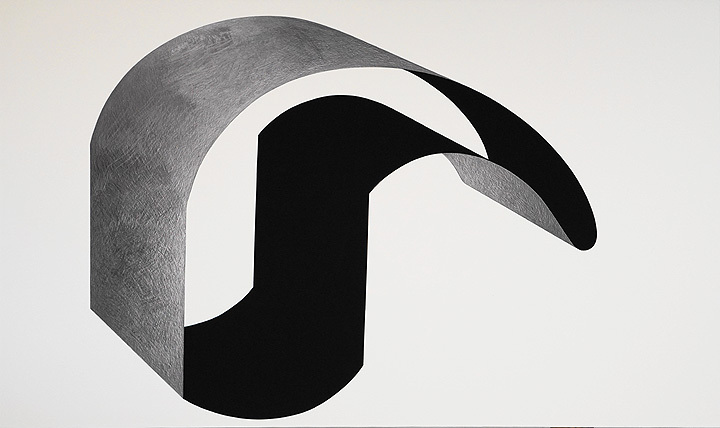 “Self-Portrait: Benin Head,” composed of reflective graphite and light-absorbing black pastel, while carving a unique geometric shape, with a sense of inside and outside, of African spiritual interiority and physical exteriority, diagrams a presence that is complex and elegantly composed. 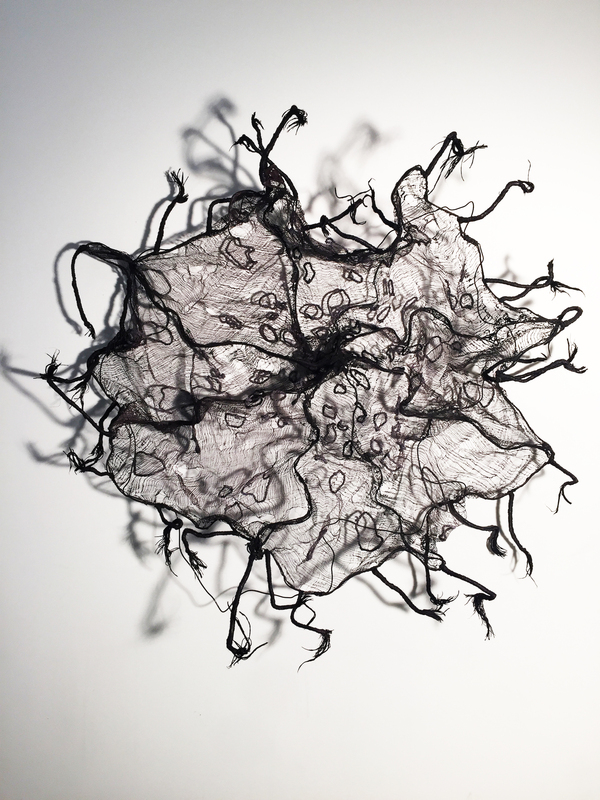 Nigerian artist Nnenna Okore’s remarkable mixed media wall sculptures are composed of found and repurposed materials — threads, buttons, wire — and achieve their presence by mirroring the vital growing processes and unique forms of nature. The delicate webbing in “Threads of Time” inscribes, in the processes of tribal arts, her working hands in the abstract expressionistic process of the image. The braiding, matting, twisting, and weaving — akin to abstract painting’s vigorous expressionistic gestures — all echo tribal hair-style techniques and textile fabrication but simultaneously locate the object in both a cosmopolitan and a tribal landscape. 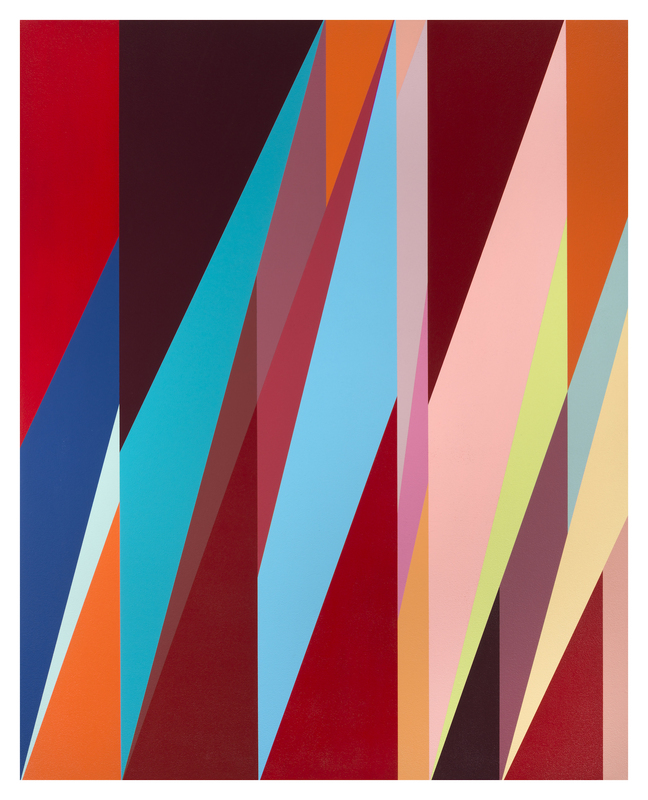 Like Nitegeka’s Constructivist-inspired paintings, we would like to see more than one work by Nigerian-born Odili Donald Odita, but one senses in his painting “Metropolitan” the celebratory vision of interlocking splinters of light and color that are metaphors for the human imagination. And like Nitegeka, he has painted huge architectural installations that, while referencing artists such as Color Field painter Kenneth Noland, are original and awe-inspiring. Osi Audu’s “Abstract Minded” exhibition places the idea of abstraction not in the tradition of Western art history, but rather in the history of ideas and philosophy. The process of abstraction that he characterizes in contemporary African art is a mode of thought that is fundamental to a worldview, rather than an art history term, and in a very real sense posits Detroit as a site of this dialogue. 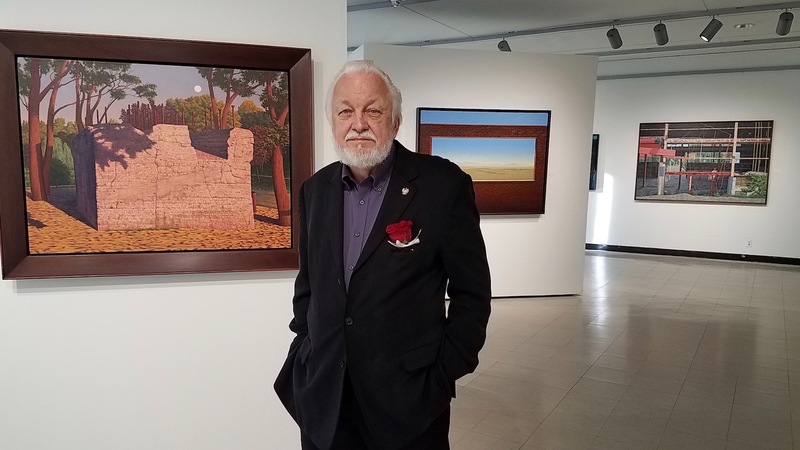 The exhibition by Jim Nawara, now Professor Emeritus of Painting and Drawing at Wayne State University, spans forty-eight years and includes more than one hundred paintings, prints, drawings, and photographs. The exhibition begins with Nawara’s imaginary landscapes seen from an aerial viewpoint that were made in the seventies and eighties. Next, an engaging series of thirty-two black and white photographs (1969-1989) presents sometimes quirky subjects selected mostly from Detroit area urban landscapes. 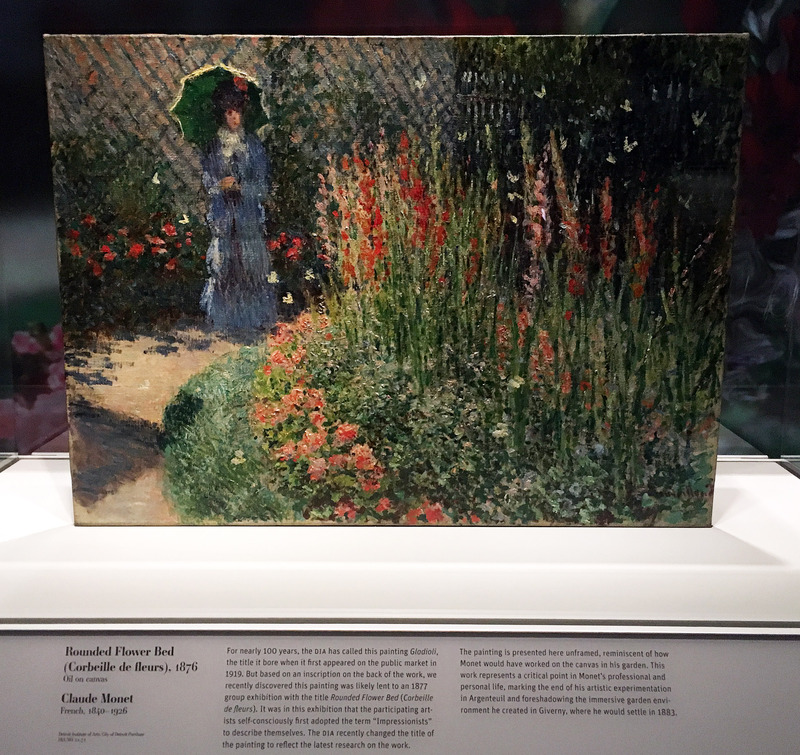 Some these compositions were influential sources for subsequent oil paintings and large watercolor paintings that Nawara has produced from 1990 up to the present. No longer seen from an aerial viewpoint, these representational landscapes are based upon observation and interpretation of actual sites that are carefully selected. In the earlier imaginary landscape subjects, the terrain was seen from a low-altitude aerial viewpoint. Although invented, these compositions evolved from actual landscapes viewed from commercial flights, light aircraft, a helicopter and once a hot air balloon flight, as well as the artist’s interests in geology, optical phenomena, and prehistory. At a distance, the work might suggest abstract color field painting, exemplified by abstract color field painters like Jules Olitski in the 1980’s. Upon closer observation, the details reveal a plausible landscape that provides illusions of crop growth, archeological sites, subtle patterns, rock formations, long cast shadows, with both actual and illusionistic textures. These works have a feel for abstraction, something that would be carried through in Jim Nawara’s later work. As an undergraduate at the School of the Art Institute of Chicago, Nawara studied under the mentor and famous photographer, Kenneth Josephson and also worked as a commercial photographer in Chicago. He went on to graduate school in painting at the University of Illinois, and studied photography there under another well-known photographer, Art Sinsabaugh. 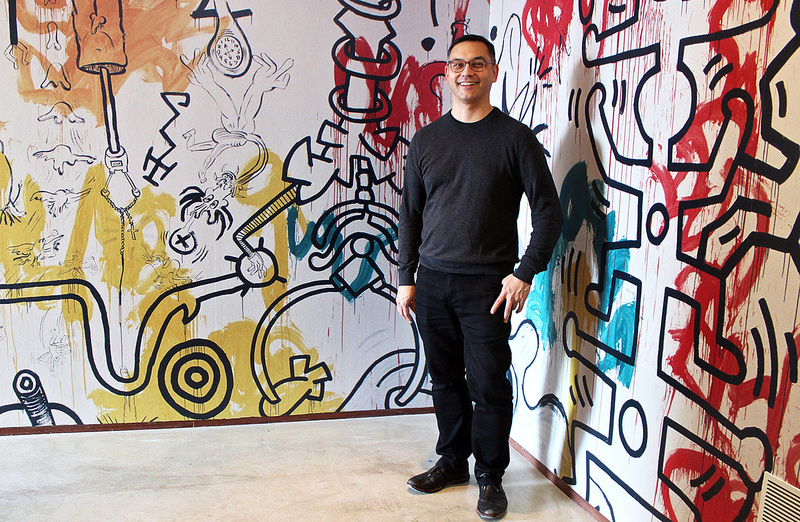 After completing his graduate degree in Illinois, Jim Nawara moved to Detroit to take a position as a drawing instructor at Wayne State University. His thirty-two photographs in this exhibition, most of which were taken in Detroit, have seldom been exhibited. He chose the rigor of always composing and printing the images full frame, un-cropped. The dates of these images overlap Nawara’s shift from aerial view subjects to landscapes based on ground-level views of actual sites. He was intrigued by the idea that an artist might be able to make art out of a “mundane” subject. In the large industrial urban landscape, RESTEEL multiple layers of broken walls and windows of an abandoned factory draw the viewer into the painting. 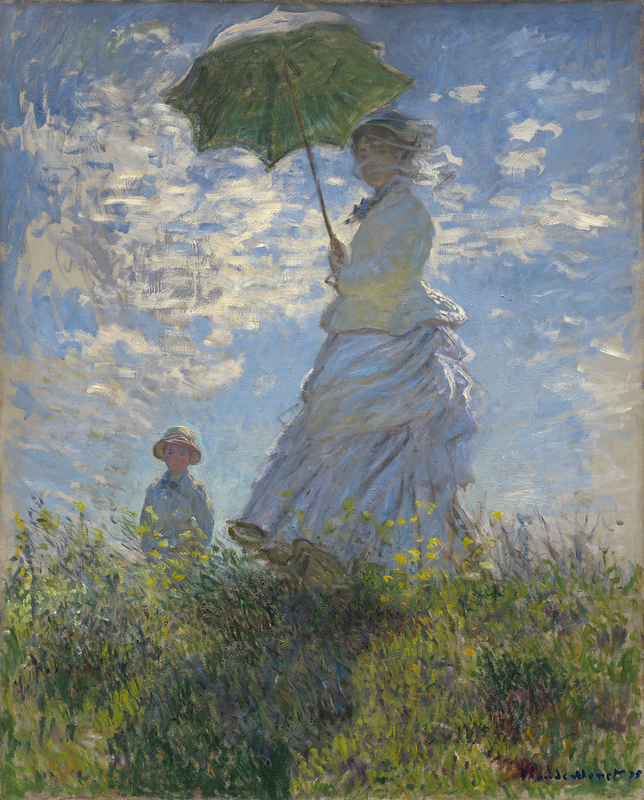 The foreground, mid-ground, and background all have their characteristics concerning light, shape, and color. It is an example of magical realism that presents an abstraction that is grounded in realism. In the foreground, the lower right brick structure plays off the left sheets of corrugated red metal, while the interior plays with a sliver of light. The imagery is divided into thirds both vertically and horizontally. It is a grid that provides us with a solitude that brings us back to multiple viewing. 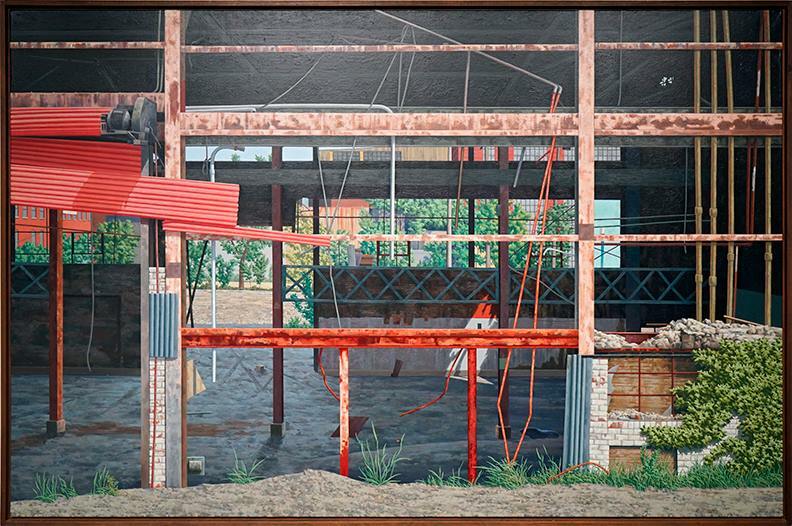 Each section of this oil painting is meticulously rendered, another reason viewers are compelled to take a long, hard look and become enveloped by this vestige of Detroit’s industry. 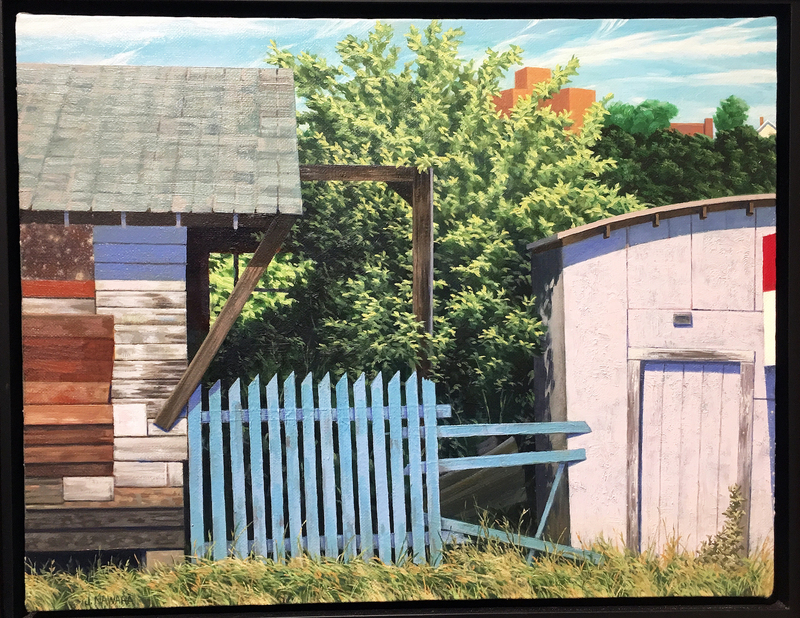 In the small oil painting, Blue Fence, from 1999 is another example of Nawara’s strong composition, illusionistic space, and placement of color. He painted the blue fence, as well as a wedge of a red, white and blue sign on the far right in crisp detail. The fence, sign, shed walls, roof, and tree are carefully layered, like flats on a stage. It is evident that placement of these compositional elements is like an abstract collage. Nawara’s Night Garden demonstrates a high level of technical facility with the watercolor medium. 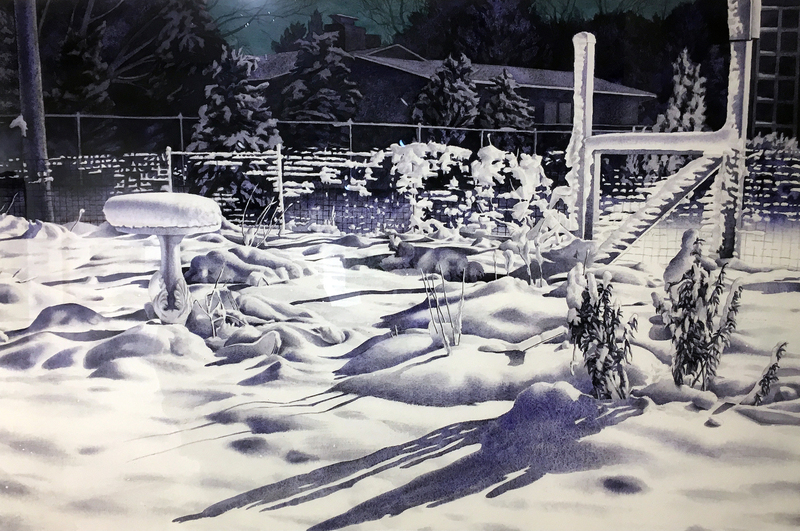 He poetically creates the stillness of fallen snow in his wife’s vegetable garden, illuminated by a strong floodlight on the back of their studio. Working from a photograph, Nawara translated the textured snow with granulated watercolor washes, particularly as seen in the snowdrifts and snow-covered birdbath. This was an ephemeral subject, as all the snow melted by dawn. The entire painting was done with just three granulating watercolors, Holbein Ultramarine Blue Deep, Daniel Smith Lunar Black, and Holbein Prussian Green. 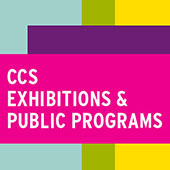 Nawara’s 2008 40” x 50” oil painting RHOMBUS was used on the announcement for this exhibition. A rhombus is a geometric term for a parallelogram, like the shape of a diamond on playing cards. 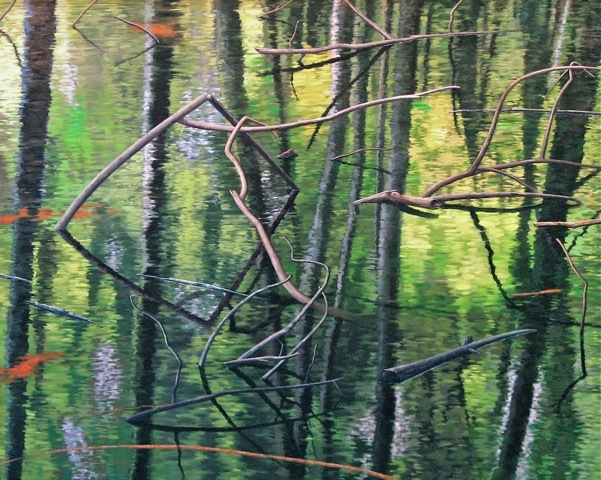 The rhombus in this painting is formed by a broken branch and its reflection in a flooded young woodland. Nawara was intrigued by the shimmering soft focus of the water surface, and the reflections of trees appear softly blurred by breezes, while the actual branches were rendered in sharp focus. Magic realism is in full play with this abstract composition, far from anything a traditional landscape painter would contemplate. Jim Nawara was pleased when a former student described his exhibition as “dreamlike”. Ron Scott: The title of your exhibition is PHENOMENA IN LANDSCAPE. What are some examples and what do you mean by Phenomenon? Jim Nawara: Anything that may be of visual interest that is happening or that has happened in the landscape; also the evidence, or traces of natural and human activity in the landscape. RS: When did the move from aerial imagery to horizon-based landscape take place and why? JN: Actually, I made my first real drawings when I was about six years old and these were graphite pencil aerial view landscapes! This was after my first airline flight from Chicago to Minneapolis. My dad worked for Northwest Airlines, and he took my brother and me on a round trip to give my mom a one-day break. I was blown away by the views out the window and made drawings of what I saw as soon as I got home. Many years later I started drawing and painting aerial views again as a graduate student at the University of Illinois. Then after about twenty years, I moved away from aerial view landscapes in the late eighties. I felt that I had plowed the aerial view field thoroughly, and I wanted to move to other aspects of landscape. 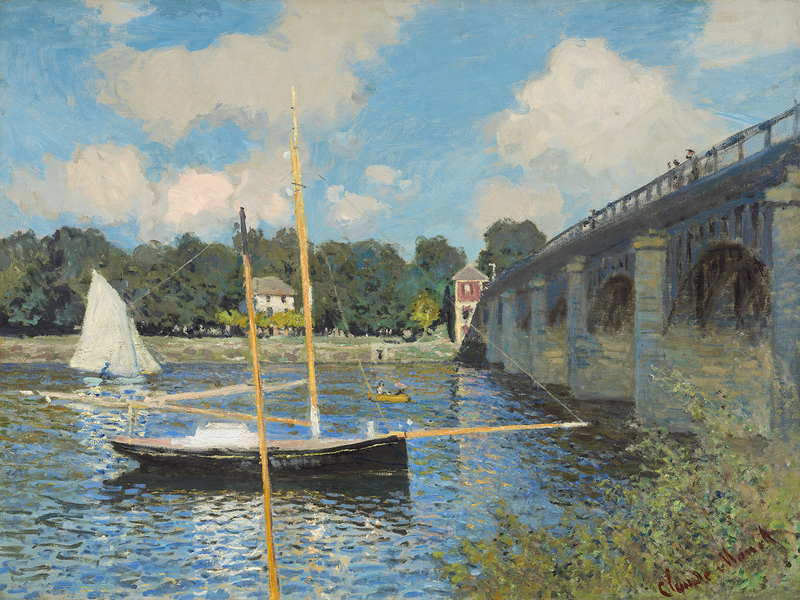 RS: How much of the work is plein-air and how important is that process to the work? JN: I have started a few paintings outdoors; but being a slow painter, I have never completed one outside. I found it stimulating, and I just kept seeing more and more information that I wanted to put into the painting! I use quick graphite sketches and photographs to define the compositions. I worked outside for two consecutive days on RESTEEL, the six-foot painting in this exhibition. Each day within two hours of my arrival the wind increased moderately, and the six-foot canvas turned into an uncontrollable sail pulling itself and me down the street! RS: What role has photography played in your artwork? How is it used? JN: My photography experience in and out of school has given me a good understanding of the differences between human vision and the way a camera records an image. This is crucial in understanding how to use a source photograph effectively for another medium. 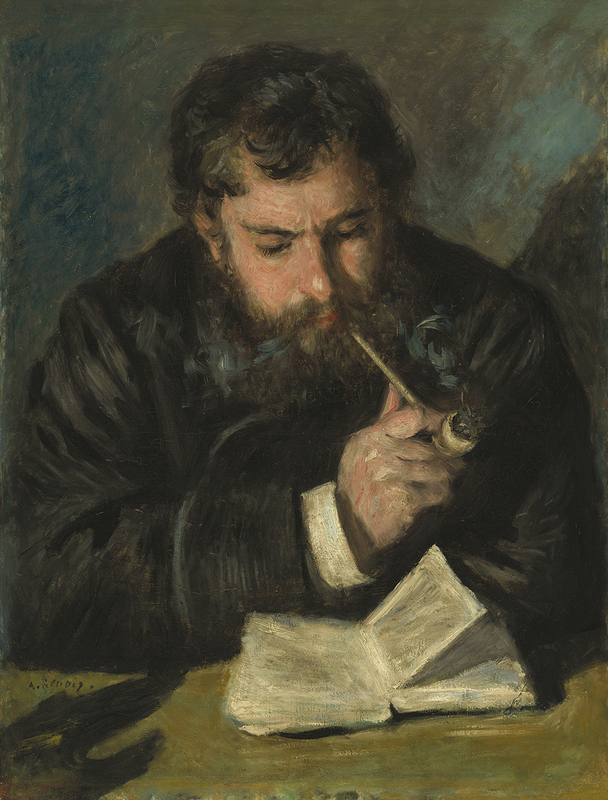 RS: How would you describe the difference in oil on canvas work, and the works on paper? Is it more than scale? Is there something inherent in the media? JN: Yes, oil and watercolor are just inherently different mediums with their characteristics and qualities. I enjoy both and often alternate between the two. The major difference is the fact that transparent watercolor dries rapidly and allows you to move forward quickly in a painting. However, you are very limited in removing color that has dried into the paper. Therefore, I have to plan out each watercolor several steps ahead. Oil paint allows you to move forward and back more easily, but each has its particular, wonderful charms. RS: Which (living or dead) artist’s work are you most attracted to, and why? JN: There are many wonderful artists who made excellent work. The first three that I immediately think of are Edwin Dickinson, Georgio Morandi, and (always) Johannes Vermeer. Check them out in books or online, but better yet, try to see some actual work in museums. RS: What attracted you to these abandoned Midwest locations? JN: I never select a site to paint because it is abandoned, though some are. I primarily consider my paintings abstract organizations of shape, color, light, and space. The paintings are always interpretations filtered through time, memory and imagination, as well as the physical process of painting. I often choose urban landscapes, but when I select a natural subject, I am interested in the effects of human activity great and small on the landscape. These events may be grand, unimportant, profound, or peculiar. I want to engage the viewer and to express something that is ineffable. My watercolor painting Lock shows a mosquito-ridden abandoned canal lock in Ohio that provided enough visual interest for me to make a painting. 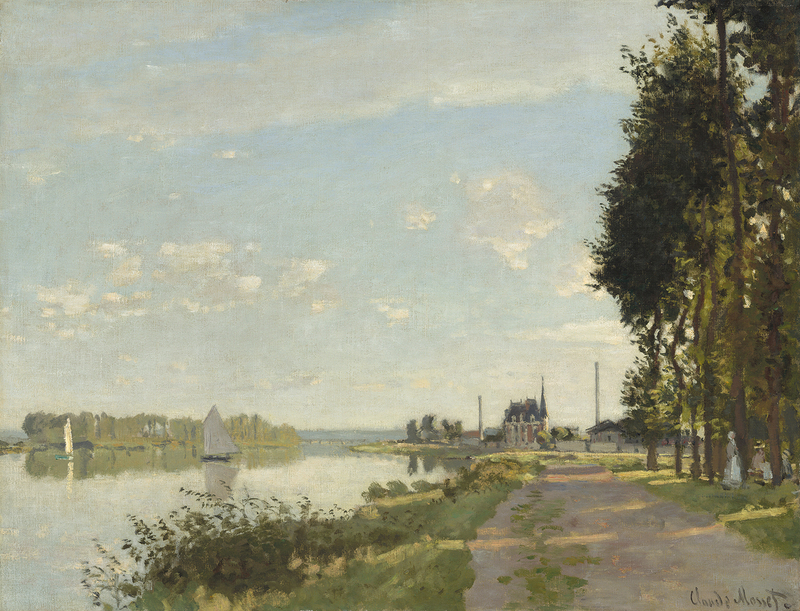 Church: A Painter’s Pilgrimage, currently on view at the Detroit Institute of Arts, presents a dazzling selection of works made by one of America’s most well-known and successful Nineteenth Century painters. Frederic Edwin Church is best known for highly rendered visions of manifest destiny- expansive, breathtaking views of the American west and South America. Church traded mainly in paintings of virgin land- land untampered with by humans (the people who had made their homes in such landscapes for millennia are mostly absent from Church’s paintings, save as the odd bit of picturesque window dressing). Land that was considered the God-given right of Church’s audience, described by the DIA as “white, Protestant, American.” One thing that A Painter’s Pilgrimage makes clear- through an excellent guide of subtly pointed remarks provided by the DIA- is how much the romance of that Nineteenth Century American, white, Protestant narrative is still with us, buried deep in our cultural bedrock. A Painter’s Pilgrimage showcases an unconventional body of work for Church- paintings made during a journey the artist took around the Middle East and the Mediterranean in the region then known as the Levant. Church rarely dealt with human history directly in his iconic American landscapes- in A Painter’s Pilgrimage, stately ruins and picturesque cityscapes layer over one another like condensed timelines of Western civilization’s cradles. Wandering the dimly lit galleries (necessary to protect the paintings) it’s difficult not to be swept away in the grandeur of Church’s vision- every single work is simply dazzling. Church was, first and foremost, a great painter. A devout Christian, he invested all his works with spiritually symbolic shifts in light, focus, and atmospheric cataclysm. His wildly billowing clouds, lurid red skies, and sublime scale speak to the greatness of his God’s creation. The visual rearrangement and condensing of human monuments that he engaged in while painting Middle Eastern landscapes speaks to the desires of the artist and his audience, who clearly felt a sense of ownership of this ancient landscape and how it ought to appear. 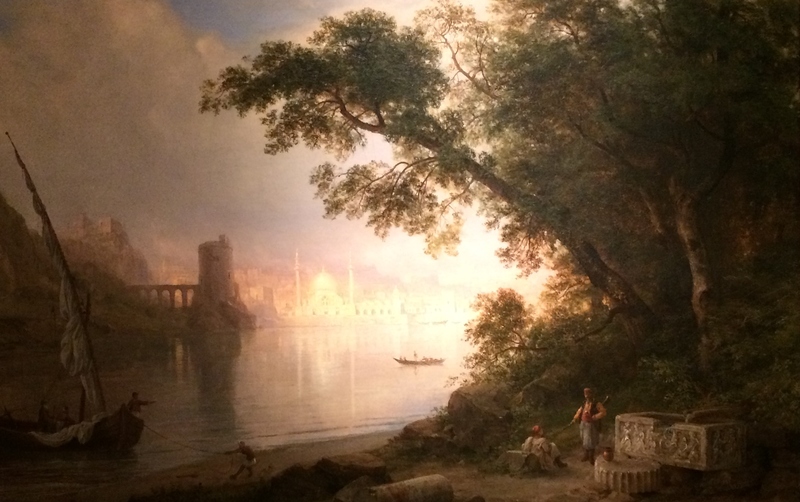 The dreamy genre painting Al Ayn (The Fountain) combines various types of architecture from different places and eras to describe the arch of civilization’s rise and fall. It also features human figures placed in the foreground, an unusual move for Church, but one that completes his romantic vision of the East. Al Ayn could be an illustration of the history of Orientalism- problematic as the image is, it’s so beautiful that one can’t help but be drawn in by it. This frisson persists throughout the show- how does one look at paintings that are so vested in the West’s destructive view of landscape and people, that are themselves posters for Colonialism, racism, manifest destiny, etc…. and yet are so intoxicatingly lovely? Jerusalem from the Mount of Olives is the stunner in a galaxy of stunners. Just beginning to get over Church’s grand but achingly overdone visions of Classical architecture (his Parthenon is so painstakingly rendered and devoid of the freshness of his smaller, on-site studies, which are sprinkled throughout the galleries like shimmering dewdrops, that it quickly gets exhausting to look at) an encounter with Jerusalem renews the eyes and stops the breath. It’s clear that this was probably the most significant site in the Middle East for Church- the epicenter of the Holy Land. 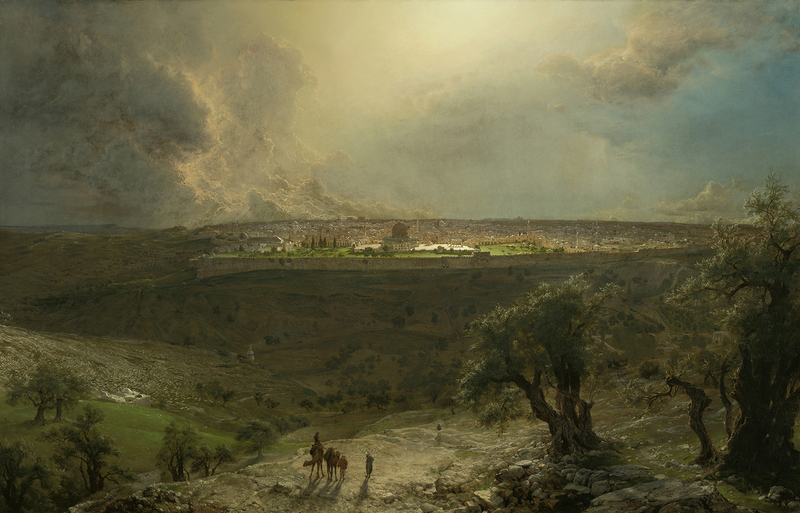 The painting is just what its title says- a view of the ancient walled city from atop the Mount of Olives, where twisted, gnarled trees reach toward the sky, symbolizing the suffering of Christ. The sublime distances roped into the view. The layers of light. The sunlit olive branches pulsating over the deep-shadowed valley. The pure, blinding light at the focal point- the Dome of the Rock at the city’s apex. Here, Church breaks atmospheric perspective- everything is far too sharply in focus for the distance, which increases the otherworldly feel of the view. The odd little comb of perfectly angled shadows of the row of columns to the right of the Dome. The dazzling tips of roiling storm clouds massing along the horizon- the vast, perfect lapis blue of the sky beyond. This is a genre painting that transcends genre- an enormous confection of kitsch that transcends its kitschiness. 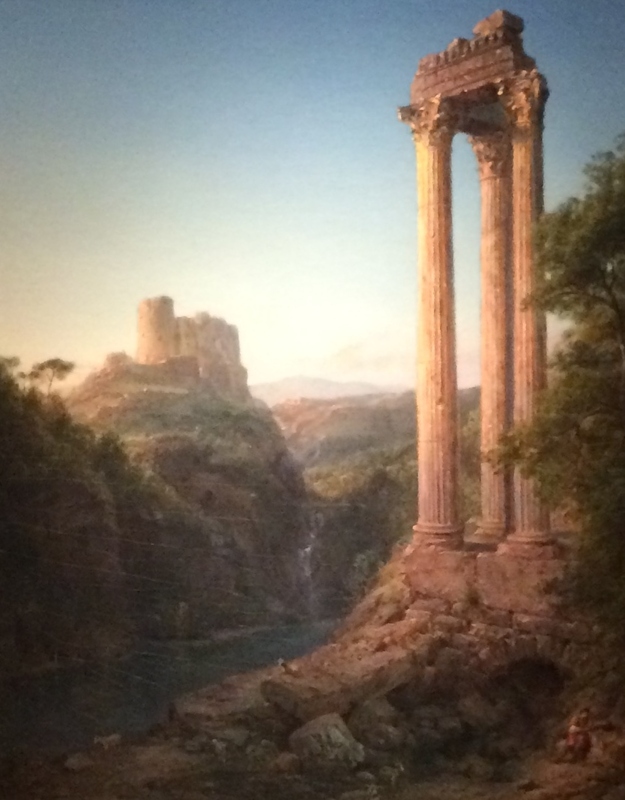 This is the paradox of Frederic Edwin Church- a painter with truly sublime vision and (for contemporary viewers) deeply problematic politics. That vision makes the seduction of those politics hard to resist. These paintings present a crystalline vision of my childhood daydreams of a vast, mythic, mysterious East. This strange familiarity suggests that Church’s vision- the vision of manifest destiny- is still with us. A Painter’s Pilgrimage is canny to that vision, and provides a great contextual, historical lesson in its making.